What do going to a zoo, hiking up a mountain and going for a bike ride all have in common? They’re fun and active, and the entire family can get on board. Instead of leaving the kids behind while you get in your exercise, do activities together to burn calories. The key is this: Don’t call it exercise. Kids need 60 minutes of “moderate to vigorous” activity daily and should not be sedentary for longer than an hour at a time. Try these quick expert tips for heart-friendly family fun. Activities should offer a challenge without being too difficult or frustrating for the child. Easy-to-learn games and toys, including hula-hoops and Big Wheels, make it easy for kids to jump into the action. Tennis and swimming, on the other hand, require a bit of practice before they can become enjoyable. Include them along with easier activities to keep kids motivated. Kids love music, so put on some fun dance-party tunes that everyone knows and then make up your own choreography, suggests Angeles Burke, Celsius‘ director of fitness and wellness. “This is a great way to get everyone up off the couch and on their feet,” she says. Children also enjoy playing with other children. Take advantage of this and start a neighborhood playtime exchange. Contact your neighbors to form group playtimes. Gather five or six families together and have one parent run the playgroup at each playtime. You don’t need formal equipment. Just grab a bunch of fun toys and active games and take them to a local park or the supervising parent’s backyard. Your community is the best place to search for activities that are heart-healthy for the whole family, says Peggy Hall, a TV wellness expert. Hall suggests looking into a community swimming pool membership so the entire family can have fun in the water. She also suggests looking for classes that both children and adults can take, such as stand-up paddleboarding, martial arts or even surfing lessons. And don’t forget fun activities like miniature golf and bowling. Those, too, are great for exercising your heart while enjoying quality time as a family, Hall says. Play a game of volleyball over a clothesline. Have jump rope/jumping jacks/push-ups contests with small prizes. Play Frisbee at the local park. Create a backyard scavenger hunt. For small children, blow bubbles and have the kids burst them using different body parts as they name the body parts. Go for a hike and name things you see that begin with different letters of the alphabet. Set up an obstacle course with hopscotch, push-ups, crunches and jumping jacks. 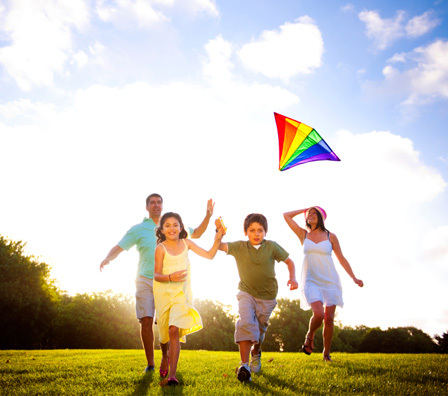 In addition to individual outings with friends, plan to have a family-activity day one day a week. Let different family members plan the trip, or give three options and let the child choose (alternate among the kids if you have more than one). Choose activities the entire family can do together: bike rides, hiking, swimming etc. Burke advises that no matter which activity you choose, you should make sure to take proper safety measures like wearing pads, wrist guards and helmets, if necessary. Some more unusual outdoor activities include “rails to trails” — using railroad beds that have been converted to trails for biking, hiking and walking. Another is geocaching, a high-tech treasure hunt using a GPS device. Enter your ZIP code on the site to find “caches” in your area. You search for the outdoor treasures using coordinates on your GPS device and then share your experiences online. After all, what’s more motivating than a prize at the end of your workout?